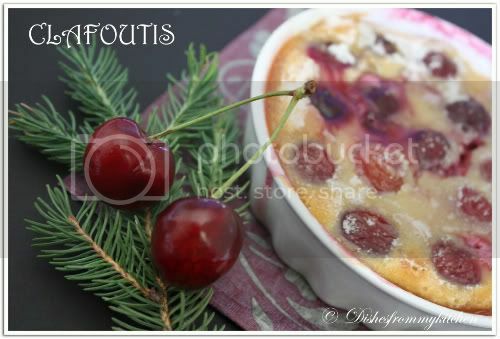 Clafoutis, sometimes in Anglophone countries spelled clafouti, is a baked french dessert of black cherries arranged in a buttered dish and covered with a thick flan like batter. The clafoutis is dusted with powdered sugar and served lukewarm. 1) Preheat your oven to 350 f. Butter the inside of a medium-sized baking dish you can use glass or ceramic too. 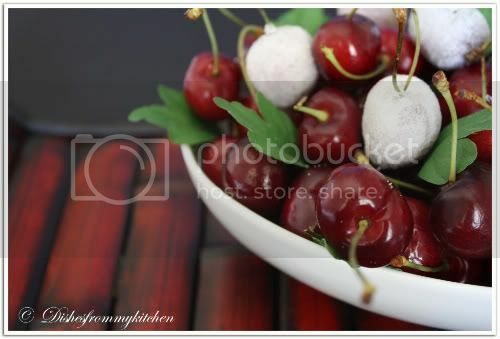 Place the cherries in the dish. 2) Beat the eggs and the 1/3 cup of granulated sugar in the bowl of an electric mixer until light and fluffy. 3) Add the flours and whisk until just combined and no lumps. 4) Pour over cherries and bake at 350 for 30 minutes. 5) Sprinkle remaining sugar over the custard and return to the oven for 10-15 minutes. Serve warm by dusting icing sugar. 1. The Clafoutis will puff up in the oven and sink back once it is cooled. 2. Since we use cherries in this recipe the water from them oozes out so baking time will be more compared to other fruits. 3.If you are using other fruits like pear reduce the baking time by 10 minutes or bake until the custard is set. 4.You can use cream instead of whole milk for rich taste or half whole milk and half cream. Either ways it taste good. 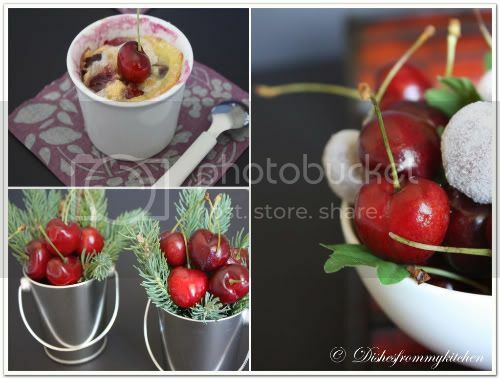 wow yummy and nice presentation..dear......and i love cherries very much..
Ooh! Cherrilicious!!!!!! Cherry Cheers to u!!!! ENTICING prep as well as the captures... Awesome Food Photographer..... We can all take these pics of yours for our color challenges on our projects in stamping..... Kudos!!!! Lovely, Your pics are making me feel hungry, looks like a light dessert to try. wow....this is something that i badly wanna try!.....since it is butterless, i wouldnt feel much of guilt too:)great pics. wow. i cant my take me eyes off this wonderful dish. its so colourful and vibrant. Love the presentation and wonderful snaps. 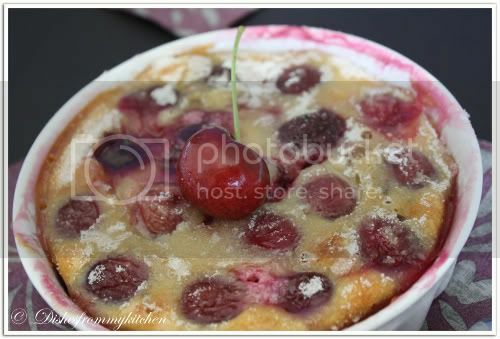 Such a droolworthy clafoutis, i used to prepare these clafoutis every year while summer..beautiful clicks..
wow so beautiful and new to me as well...love all your beautiful clicks pavithra...really worth seeing many times..
first time hearing about this dish. lovely presentation. Wow!! This is new to me, sounds real yumm!! Bookmarked!! What a wonderful presentation Dear..makes me drool..yummy.. This dessert looks simply devine.Beautiful photos too. Clafoutis looks really yummy. I liked the individual serving. Looks yummy and my DD made this few weeks back...great way to have fruit in your diet.. Wonderful dessert, Pavithra..Tempting pictures too..
Looks very delicious. the photos are awesome. 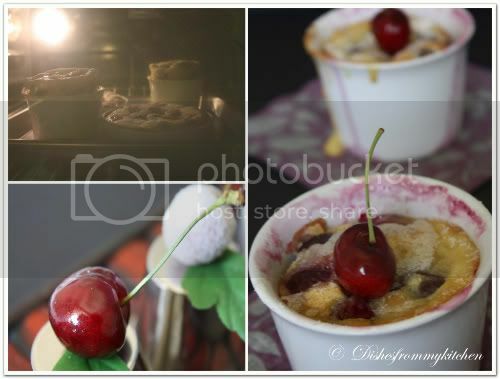 I made cherry clafoutis following Julia's recipe for hubby's bday. Yours looks delicious! Thats so new to me the recipe! 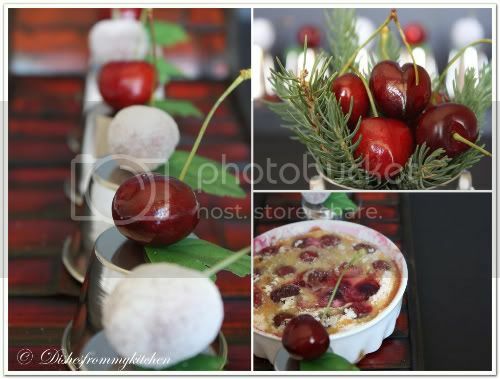 wow, wonderful dish, beautiful clicks and perfect for this cherry season. wow! !u r coming up with new dish variety's..with no butter...Iam seeing so many cherries but dono wat to prepare with them .Now i can do des.superb "Idea". 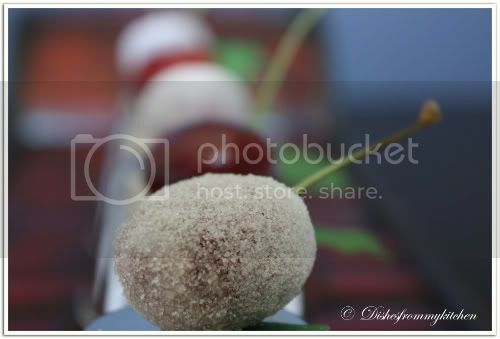 Never heard this one before but they look so delicious.Awesome clicks!! 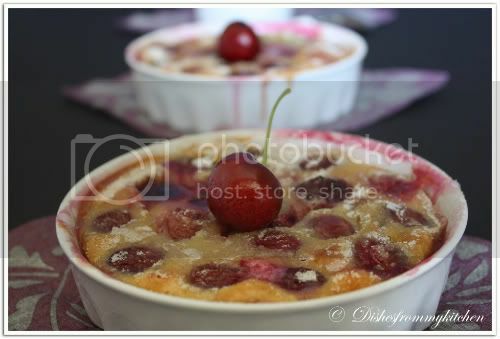 I adore clafoutis... and this sound wonderful!! 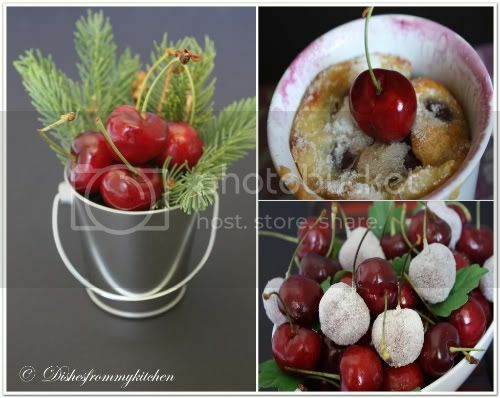 Pavi - you can just make good old cherries from the plant look gorgeous! I just have about 3 lbs of cherries that I picked up from my farmers market - something tells me that I should make these. beautiful... and nice presentation too.. simply superb.. wow!!!! wow!!!!!! I can keep saying wow.. So yummy and looks perfect. clicks are awesome. I am drooling here. I am a great fan of your recipes and food photographs, it will be our pleasure if you could participate in our Sizzling Summer Contest. Woho amazing pictures...amazing recipe...me too baked de same last week....will soon post on my blog. makes me wanting to bake one more batch. Looks so yummy.I luv cherries:). Love those cherries. I have a basket of cherries and this is exactly what was on my mind! What a co-incidence. Now I cant resist baking them! I feel good , you lefy your comment at my blog. I am here after a long time and missed many. This sweet dish is awesome! I am going to make it. The photographs are very nice. The Notes and tips are those , I always look forward to. Presentation n introducing new dishes from different cuisine is always appreciable pavi.Clafoutis has turned out so succulent.